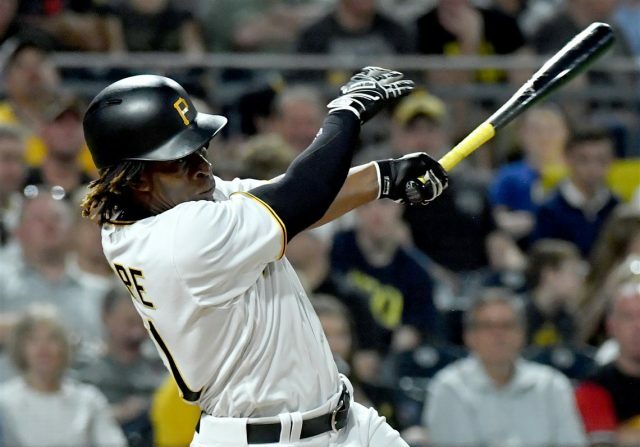 Gift Ngoepe has become the first African-born athlete to play in Major League Baseball (MLB) after he made his debut for the Pittsburgh Pirates. The 27-year-old South African represented the Pirates for the first time in the 6-5 win over the Chicago Cubs at PNC Park. Ngoepe, who grew up in Randburg near Johannesburg, had initially signed for the MLB franchise back in 2008 but had been playing in the lower leagues since then. His debut, which came nine years after he put pen to paper on a contract with the Pirates, is seen as breakthrough for the sport. “It was emotional, and I had to fight back the tears,” Ngoepe told ESPN. “I told myself not to cry, because I’m in the big leagues and I’m a big guy. “I thought about where I’ve come from, making the journey from South Africa to pursue my dream of playing in the major leagues someday. “I thought about the struggles of being in the minor leagues for eight-and-a-half years and then to finally get up here and get a hit in my first at-bat. “The whole thing was just awesome. “That’s the only word I can think of to describe it. Ngoepe’s first appearance on the MLB stage was met with widespread acclaim across the globe and the baseball world. It came a day after Dovydas Neverauskas became the first Lithuanian born and trained baseball player to reach the major leagues. Ngoepe, an infielder, became the sixth South African to sign a professional contract when he agreed to terms with the Pirates in 2008, but none have gone one to make an appearance in the MLB. He represented South Africa at the World Baseball Classic 2009 and last year at the World Baseball Classic 2017 qualifier in Sydney in Australia.